So after having tried my luck with real-time strategy games, entries in the Halo franchise, eroge and others, my journey to broaden my horizons by reviewing games in areas that I typically haven’t had much prior experience with has led me to vehicular simulators with Diluvion. 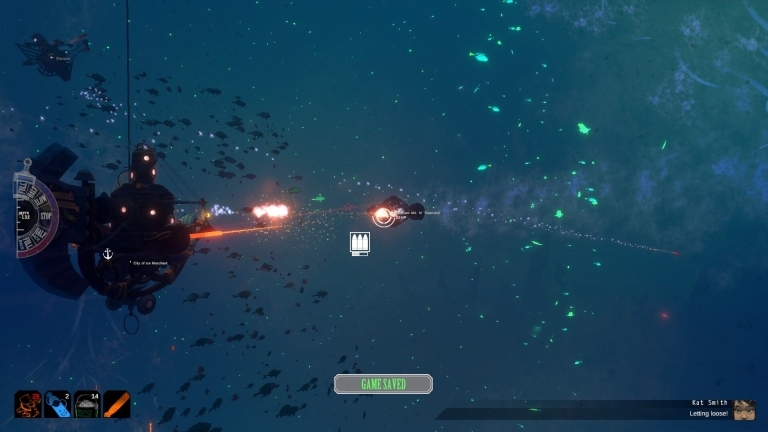 Granted, the vehicle in this case is a steampunk submarine traversing a post-apocalyptic underwater world, and Diluvion bills itself as more of an action game with RPG elements, but at its core, it is still about traversing a vast world in search of adventure while maintaining and upgrading a trusty vehicle. The steampunk fantasy angle is what easily hooks many, but is this underwater adventure a trip worth taking, or should we just abandon ship and let this wreck sink to the bottom? Diluvion’s setup should sound familiar to those who have played another notable indie game about sailing and exploration, Sunless Sea. You are one of the remnants of a once-thriving human society, forced underwater by a huge calamity and finding themselves having to rebuild and adapt, leading to an alternate universe (one with more of a steampunk vibe, in this case). And with this new society 20,000 leagues under the sea comes new tales, mainly the one that speaks of the Endless Corridor, an extremely deep, dark, and dangerous area rumored to hold a treasure that ushers in a new golden age of mankind. Needless to say, it’s up to you and your adventurous spirit to seek out this treasure for fame, glory, and humanity. 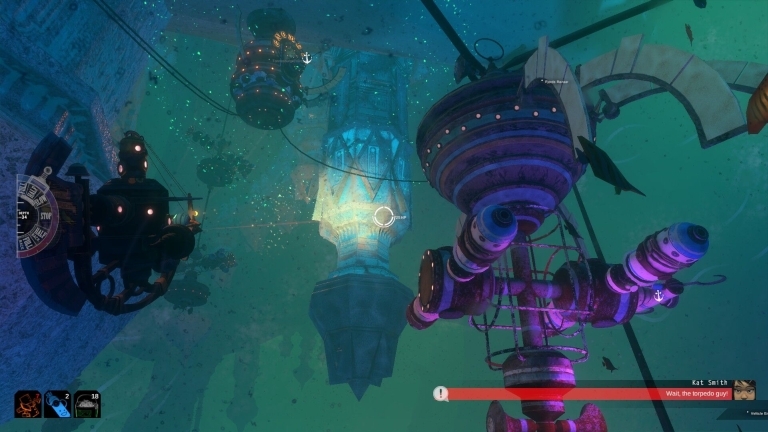 So immediately, Diluvion nails the atmosphere right off of the bat with some impressive graphics. The icy tomb that is the ocean you wander is simultaneously dark and beautiful, be it coming across massive structures and sunken ships or just little houses and beacons you see along the way, with the murky waters giving off the feeling of discovery as they reveal either danger or sanctuary (said mukriness being a slight double-edged sword, though, as we’ll get to). And the mix of styles as you switch to a more comic-inspired 2D view whenever managing your ship or exploring a new indoor area is executed wonderfully, creating a distinctive look that really stands out, even if it could have used a few more character models for the 2D bits. 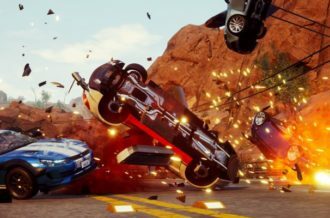 Notably, switching into a 2D area essentially puts the game into a sort of “bullet time” mode where things still move around or hit you, so when you’re in a hurry or under attack, you have to think faster than usual. 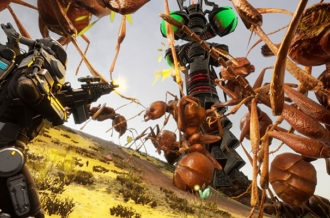 Maybe you’ve encountered a sudden foe requiring you to see if you should direct the majority of crew members towards working on the helping the gunner, or maybe you’re escaping from a more powerful foe and suddenly head into a building you find in order to refill your air tanks and see if it contains any rare loot or mission objectives you may need (which also requires you to hunt for the crates and boxes that can be opened). The fact that you’re never truly safe at any time nicely emphasizes the danger of the sea, and creates some real suspense and excitement when it comes to scrounging and taking care of your ship on the fly. Switching between the 3D and 2D views of your ship is done with the touch of a button, allowing you instant access to your ship and crew at any time, who you can speak with and ask about their own backgrounds, with each member you hire having their own tale, and the little relationships you can build are definitely a nice touch. And alongside being able to switch between views, the rest of the controls are quite superb as well. Commanding a giant sub like this at first seems daunting, but thankfully it’s handled in such a way that it quickly becomes easy to get used to (even if you may still accidentally get confused now and then over the Q and E keys lower or raise your ship’s depth). Also, it might seem silly to praise a mechanic like this, but the almost rodeo-esque way where you enter a building by harpoooning the port and holding the key down to reel yourself in just feels damn fun. Trivial, but fun. 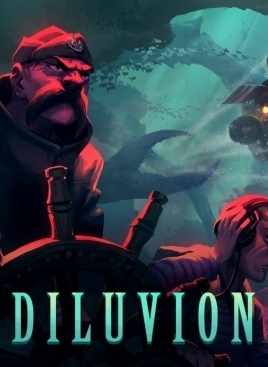 Now, you may have noticed earlier on that a comparison was made between Diluvion and Sunless Sea. 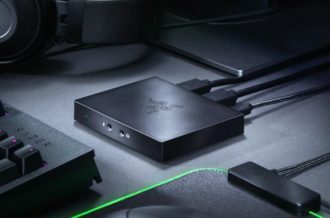 And while the positives from the latter carried over as well, such as a vast world, dark feel, emphasis on dialogue, et cetera, I was afraid that the big negative I had with it, namely that combat felt like more of a chore than expected and that was to be avoided at all costs, would be here as well. Well, while it probably is advised to stay away from battles as much as possible (especially with those involving two or more enemy ships), combat here felt more manageable, even flat-out fun at times. Chalk that up to either the battles being quicker, the ability to have crew members repair faster, the ability to upgrade or purchase new ships, or controls that are easier to use, but skirmishes felt like less of a hassle, even if exploration was still the primary focus. That being said, the actual act of exploration tends to get a bit hair-pulling at times. We all appreciate a game that doesn’t hold the player’s hand, but there’s a difference between a lack of hand-holding and being deliberately unhelpful. For one, you can only save by swimming through schools of light blue fish typically found at landmarks, and you don’t get any checkpoints. So when you’re given a checklist of different parts to collect and go scavenge several abandoned labs for fifteen hull pieces, only to find your yourself blown up by a pirate right after the quota was checked off, then too bad, back to the last save for you. Also, while the idea of navigating by landmarks like a real sailor from older eras would is definitely a fun idea in theory, it does make getting to new locations a bit of a chore. You’re wondering where a vital item you need is, and then one of your crewmates suggests they should try a guild in a specific town. Okay, except none of the crewmates actually mention where this specific town may be. Sure, you may have several landmarks discovered and already placed on your map and compass to navigate with, but without any hint as to which landmarks you should check in the vicinity of, you tend to wind up wandering aimlessly, and in a game where you have to purchase food for the crew and manage your air levels, that means wasting precious resources (unless you grind for upgrades, of course). There are golden fish designed to guide the way, but after a while they stop acting as direct guides and only lead to vague areas you’re supposed to check the vicinity of, seemingly leading to dead ends at times. Throw in the more murkier moments making it harder to distinguish things, and annoyances can build up after a bit. 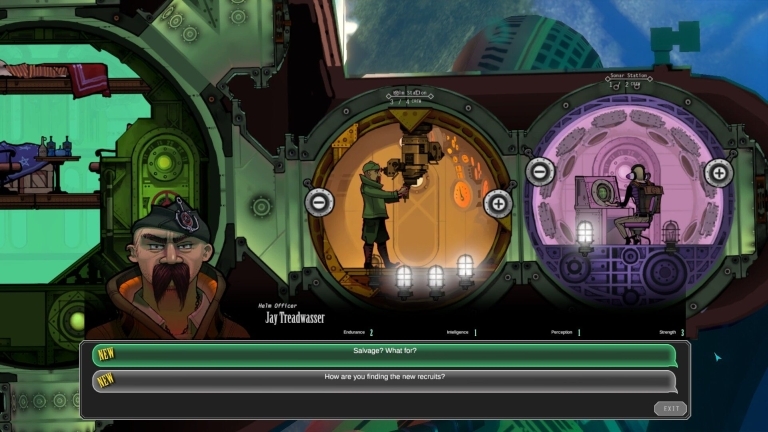 And to be honest, I kind of have suspicions that Diluvion (or at least the version of it I had) may suffer from a bug that could be preventing progress, because every time I died or loaded a game, all of the dialogue options would reset to being labelled as “NEW” in the game. 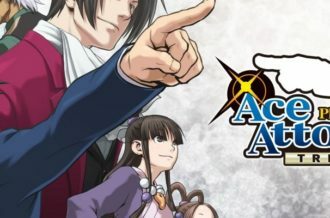 Suddenly every character I encountered was acting as though I had seemingly encountered them for the first time, regardless of whether or not I created a new save, and so pondering began over whether or not this was blocking off new choices for dialogue required to unlock necessary information. And even if this isn’t a game-breaking bug, it’s still a notable annoyance, with notifications popping up. Upon getting past the tutorial level, one of the crew members expressed sheer excitement over seeing a massive ice city for the first time. Two hours later, while searching around for new info/loot to grab, they still had the same reaction, as though they suddenly suffered from short-term memory loss. But of course, that could all just be me, though it’s not exactly the greatest sign if you have to question whether things are genuinely wrong or if you just stink at the game. Diluvion and me seem have a bit of a love/hate relationship. 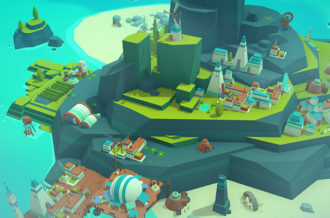 Every new session starts out as fun, as you begin to seamlessly set out looking for new landmarks, cities and treasure in some impressive seafaring gameplay where it just feels like fun simply to sail around and look at everything, but after a while frustration kicks in as the game’s habit of limiting more helpful elements to the player begins to hinder the experience as you wander about, eating up resources. But in the end, Diluvion still has some impressive visuals, a enjoyable world and atmosphere and some strong gameplay mechanics, so if you have the patience, it’s worth giving a shot. It is still an icy tomb, but even the wrecks are rather glorious once you get up close to them (and loot them for rare books and whatnot).